Was struggling between Bali Safari and Bali Zoo but didn't get much information from the official website for the later one. Occasionally browsed a website with attractive price for Bali Safari, so we made up our mind to go there instead. 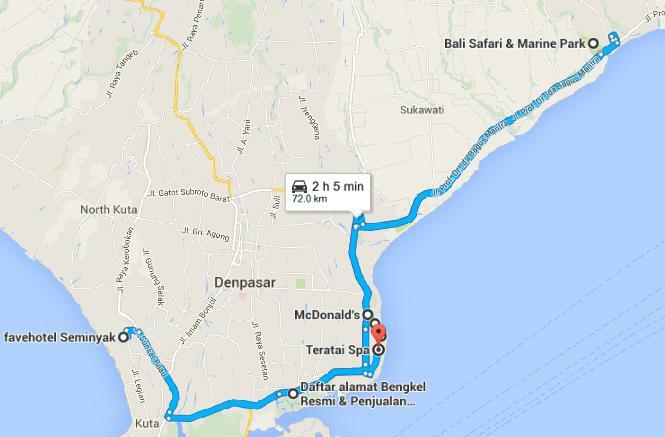 Moved to Sanur today as it was much closer to the Bali Safari. Purchased the Jungle Hopper tickets via Klook in advance at USD39/ person with the original price at USD49! (Now price has gone up to USD55 but still selling at USD42 via Klook) Plus, free transfer was included at Sanur McDonalds , we didn't plan to hire a car today since we both thought that we could save at least Rp300000 taking taxi around the area under our precise calculation. With our baggage all ready and breakfast packed (Yes! The staff let us pack some food as take away! Probably they knew that we were in a rush! ), we hopped into a taxi with metres and went straight to Sari Villa Sanur Beach to check-in and drop our baggage. We asked the taxi driver to wait for us heading to McDonalds since it would take us around 15 minutes walk to get there. We didn't want to miss the free transfer not being affirmative with the direction, so talking a taxi was definitely the best option for us. In the end, it only cost us Rp114250 for both trips, which was more than reasonable. Still got much time to go until the free shuttle arrived, we decided to try the McDonalds breakfast in Bali. It had no differences from those in Hong Kong except the price was much cheaper there (Rp31364). Was wondering why there were so many students at McDonalds during school time. Were they having a break? We tried to ask them but couldn't get the answer. They were just smiling to us. Maybe they were too shy or just didn't understand English? Arriving at the safari, we showed our printed e-tickets to the staff and got the paper bands as recognition for the shows and photo booths. Food and drinks were not allowed but they could help keeping them at the entrance after the security check and we were able to get them back when we left. That was fair enough. Schedule of the shows was shown at the entrance so that you won't miss any of them inside the park. The first thing we did was to hop on a safari-themed vehicle which carried us a short way through the jungle to the actual entrance to the park. Such a delicious appetizer to set the trip to the safari. Lawrence got pretty excited since it was his first time to visit a safari like this. It reminded me of the night safari in Singapore though. Clear directory everywhere not allowing you to miss anything in the park. We found the price reasonable considering that we got a chance to pat and hold an orangutan, a macaw, a lion cub and the endangered binturong. Souvenir shops selling interesting stuff about the animals were quite expensive even though discount vouchers were given at the entrance. We didn't buy anything but for sure they all worth taking pictures as part of our memorable experience. The animal show was free to watch and short enough not to bore us. It focused on understanding and appreciating nature, as well as helping wild animals by sustaining their natural habitat. The elephant show was great and let us get up and personal with the elephants with photos allowed. The park even thought of a way to lend a helping hand to the earth by turning poo into useful paper. Beside big animals, we were able to have a close contact with those small ones. Seeing everybody heading to the same direction, we both sensed that there must be something big happening in the park. Yes! We were right! A show in Bali theatre would be held in short. The show was based on ‘the Legend of the Balinese Goddesses’ and is an awesome production that will please adults and kids alike according to the official website. Some even say that this is the main attraction of the park, while we both got a bit bored and could see some of the kids around did... Anyway, it was a nice theatre to rest a bit after lunch. The most wonderful part that I longed for was the safari journey where we could take the vehicle and get close with the wild. We didn't spend time at the water park at all though it looked fun but made our way to the entrance for the free shuttle back to Sanur. Bali Safari is a well-run place. The attractions are well spread around. The first thing I appreciate is the cleanliness of the place, especially the restaurants & toilets. The staff were very friendly. The animal shows were amazing. Spending a day in the wild was one of the highlights in our trip. Back to our hotel and got a great surprise! It was only HKD312 but the room and service were both up to standard! The staff helped us to take all the baggage up to our room and it was well decorated even it was not for honeymoon. There was a balcony to dry our clothes and the bath tub with flowers for us to enjoy a relaxing moment after a whole day walk in the safari. Saw a Japanese restaurant opposite Hardy's and the price was very cheap (Rp101000). We were interested in it also due to the whole lot of Japanese comics books on the shelves. We gave it a try but it let us down. The moral of the story: local food should be the best choice when you go travelling. Wander around and searched for foot massage. There were not much choices and we stopped by Teratai Spa due to the attractive price. Foot massage for 60 minutes was only Rp70000. However, we found it way less comfortable than La Karma Spa. The staff were kind of pushy selling us more expensive package. They also gave us some signals giving them more tips. Anyway, not having a pleasant experience there. The hotel is cheap but looking great! So nice to get close to wild animals too! Yea! Actually there are plenty of options in Bali ranging from cheap to expensive prices. A really great place to cater different kinds of travellers. Thank you so much for sharing so beautiful photos. I would like to ask, which package did you buy to get to pat and hold an orangutan, a macaw, a lion cub and the endangered binturong? I would very much want to experience that too. I will be going to Bali Safari on Dec 30. Hi Dalien! I just bought the cheapest Jungle Hopper package, and all the encounters with the animals are free in the park! I am not sure about the differences between other packages except they are having better seats reserved for the show. Nevertheless, it was not necessary for me since it was not the most essential issue.